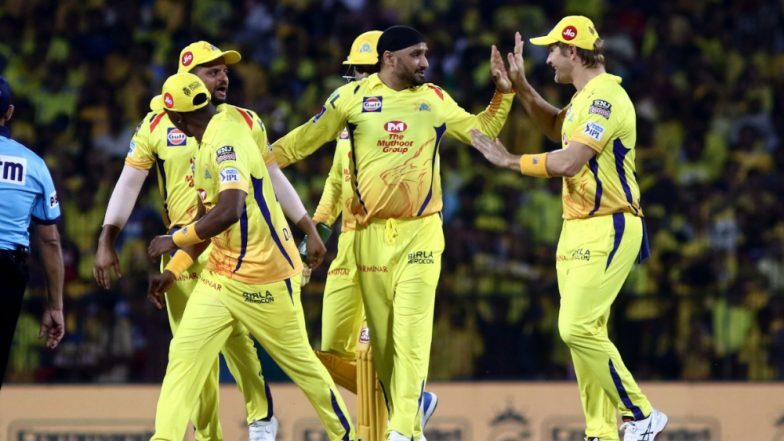 Defending champions Chennai Super Kings (CSK) started their IPL 2019 campaign in style as they defeated Royal Challengers Bangalore by seven wickets at the MA Chidambaram Stadium in Chennai. Chasing a small target of 71 runs, CSK did lose three wickets but were always in control of the situation. CSK vs RCB IPL 2019 Highlights. After winning the toss, Super Kings opted to bowl first and MS Dhoni’s decision proved to be a good one. Harbhajan Singh had RCB on the back foot early on by scalping quick three wickets. The veteran spinner removed Virat Kohli, Moeen Ali and AB de Villiers to leave RCB tottering at 38 for three. Things then got worse for RCB as debutant Shimron Hetmyer was run-out followed by strikes from Imran Tahir and Ravindra Jadeja. Tahir went on to pick two more wickets and returned with impressive figures of 3/9. Jadeja scalped two wickets as well. Parthiv Patel was top-scorer for RCB. Suresh Raina Becomes First Batsman to Complete 5000 Runs in IPL. # Suresh Raina completed 5000 runs in IPL, first to achieve the feat. # This is CSK’s seventh consecutive win over RCB. # This is RCB’s third loss in a season opener of IPL. # RCB’s 70 was the sixth-joint lowest team Total in IPL. # This is CSK’s 15th win over RCB. # Yuzvendra Chahal has now conceded least runs in a 4-over spell in an IPL match in India. # 70 is now the lowest score against CSK in IPL. CSK’s chase began on a shaky note with Yuzvendra Chahal removing Shane Watson in the third over. Ambati Rayudu and Suresh Raina then added 32 runs for the second wicket to take CSK close to the target. During this stand, Raina became the first batsman to complete 5000 runs in IPL. Funny RCB Memes & Jokes Attack Virat Kohli & Co. As They Go Down Against Chennai Super Kings in IPL 2019 Opening Match. Super Kings then lost Raina (19) and Rayudu (28) towards the end. Kedar Jadhav and Jadeja then guided CSK to a seven-wicket win and with that, the defending champions opened their camping with a victory.